Is there a similar piece of software to SourceTree, a GUI for git, for Linux? I know about Giggle, git cola, etc. I'm looking for a beautiful, easy to use GUI for git. Its still in its development phases (1.5.1 is still missing HiDPI support), but gets basic work done. This could easily compete with GitEye and SmartGit. Its better than QGit for sure. GitEye is pretty good stuff. Also, free (as in beer). GitKraken is the best GUI for linux on working with git. It free only for non-commercial use. No other GUI clients for linux match this as of writing this answer. You should consider taking a look once. 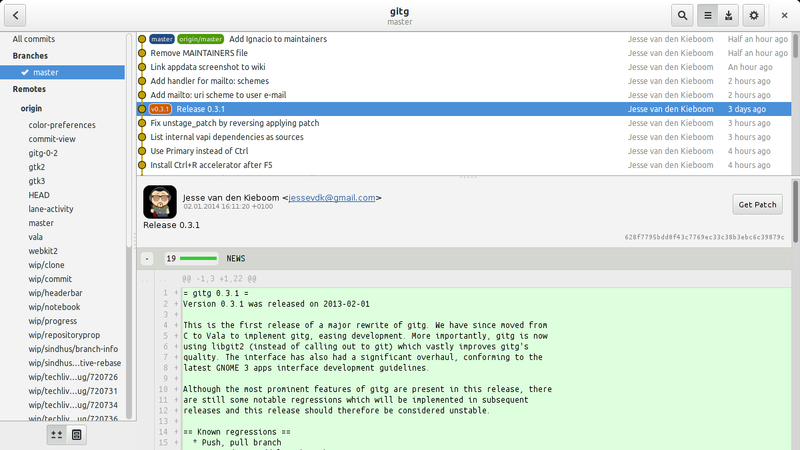 gitg is the GNOME GUI client to view git repositories. If you can use any JetBrains IDE (https://www.jetbrains.com/), I recommend you to do so. They have a pretty nice built-in GUI for git (and also other VCS)... maybe not so packed with features as other software mentioned here, but it does it job. Also, qgit works for me. The only issue I encountered was when I tried to switch to a dark (white-on-black) GTK theme. latest visual studio Code editor for linux has very smooth git integration.